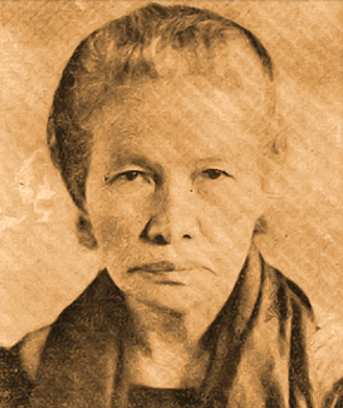 Today in Philippine History, October 13, 1868, Teresa Magbanua was born in Pototan, Iloilo. On October 13, 1868, Teresa Magbanua, the first woman fighter in Panay and known as the "Joan of Arc of the Visayas",a school teacher and military leader, was born in Pototan, Iloilo. She was the second of six children of Don Juan Magbanua and Doña Alejandra Ferraris. She was married to Alejandro Balderas, a wealthy landowner from Sara, Iloilo. Despite opposition from her husband Magbanua followed her two brothers in the revolutionary movement and took up arms against the Spaniards, leading troops into combat and winning several battles under the command of General Martin Delgado. Displaying courage, patriotism and military tactics, she took her first battle in Barrio Yating, Pilar, Capiz on December 3, 1898 where she led a band of rifle sharpshooters and bolo men, and defeated the Spanish troops in the area. Fondly called by her unit as "Nay Isa", Magbanua became a unit commander and engaged in the Battle of Sapong Hill where she and her troops became victorious. During the Philippine–American War, Magbanua participated in several battles against superbly trained and armed American forces, as did her brothers Pascual and Elias, who were both ranking officers. On February 11, 1899, "Nay Isa" along with General Martin Delgado, fought in the Battle of Iloilo City. She also participated in the Battle of Balantang, Jaro of March 1899. War brought her too much sufferings after she lost her two brothers. Her brothers Pascual and Elias both died under mysterious circumstances. After numerous battles, she had realized that her dream of an independent Philippines would have to wait. She disbanded her troops and surrendered to the Americans in 1900. While not an active fighter during World War II, Magbanua did what she could to resist Japanese forces, selling her possessions to purchase food and supplies, which she would then give to the local guerrillas. Her marriage to Alejandro did not produce any offspring. Alejandro died shortly after the Japanese occupation. Magbanua moved to Mindanao after the end of World War II and lived with her sister Maria in Pagadian, Zamboanga del Sur. She died in August 1947.